After a rough stretch, Team Georgia closed the 24th annual Junior Sunbelt Classic strong with a 4-6 record and finished ninth. They closed with consecutive victories over Oklahoma Blue.. Team Georgia got off on the wrong foot to open the tournament against Canada, falling 7-6 on a walk-off single in the bottom of the seventh inning. After falling behind 5-1, Team Georgia clawed its way and trailed 5-4 in the sixth, then tied the game at six in the top of the seventh. But Team Georgia rebounded with an impressive 8-0 victory over Tennessee in the second game on opening day. Pitcher Colby Williams (Troup) hurled a one-hit shutout and faced just one batter over the minimum. Wade Richardson (Hillgrove) finished 1 for 2 with a double and three RBIs on offense, while Colby Thomas (Valdosta) and CJ Rose (Lowndes) each finished with two hits and an RBI. On Day 2, Team Georgia won its second straight game, an 11-4 rout of Mississippi. After jumping out to a 4-0 lead, Mississippi battled back to tie before a six-run fourth inning gave Team Georgia the lead for good. Gage Morris (Cartersville) earned the victory in relief, pitching 3 1/3 innings of scoreless baseball. He struck out three and didn’t allow a hit. Richardson went 2 for 3 with a triple and three RBIs, while Dalton Smith (Lowndes) added a three-run homer. Thomas finished 2 for 4 with a double. But in the second game of Day 2, Team Georgia made three errors and mustered just one hit in a 5-1 loss to Missouri to fall to 2-2. Richardson had the only hit, while relief pitcher Alex Flood (Brookwood) allowed just one hit in 4 1/3 innings of scoreless baseball. Team Georgia’s rough stretch continued on Day 3 in a 12-6 loss to Colorado. They committed four errors and the pitching staff surrendered 12 runs on 18 hits. Rose and Thomas homered in the game. Rose, Daulton Schley (Ringgold) and Trent Bailey (LaGrange) finished with two hits each in the setback. On Day 4, Team Georgia fell 10-7 to Texas despite getting more hits (8 to 7). Ben Schorr (Columbus) went 2 for 3 with two doubles and two RBIs, while Brian Port (Starr’s Mill) and Dalton Thomas (Ola) finished with two hits each on offense. In the second game of the day on Day 4, Team Georgia’s comeback fell short in an 8-7 loss to Oklahoma Gold. Team Georgia scored three runs in the top of the seventh and had the bases loaded, but Oklahoma Gold got a fly out to end the game. Rose went 3 for 4 on offense, while Williams, Holden Tucker (Ringgold) and Dalton Thomas finished with two hits each. On Day 5, Team Georgia gave everything it had against eventual tournament champion Arizona in a 6-4 loss. Port went 2 for 3 with a double, while Seb Thomas (Marist) had a two-run single. 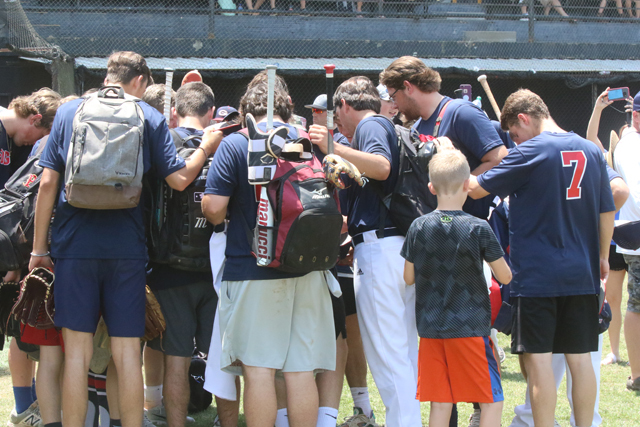 But Team Georgia rallied from a three-run deficit in the late game on Day 5 to beat Oklahoma Blue 9-6. The big blow was a seven-run sixth inning. Dalton Thomas earned the victory in relief of starter Connor Bruce (Loganville). Brandon Prince (Carrollton) went 2 for 3 with a double, while Port and Colby Thomas each had two hits and three RBIs. The victory gave Team Georgia a 3-6 record in tournament play and the two teams played again for ninth-place on the final day. Team Georgia held nothing back, scoring four runs in the first inning, then added 12 more in the second enroute to an 18-3 victory. The game was called in the fourth inning on the mercy rule. Aaron Wainwright (Camden County) earned the victory on the mound. Schley went 3 for 3 with five RBIs and a homer to lead the offense. Colby Thomas also finished with three hits, while Richardson, Prince and Dalton Thomas collected two hits each. Prince finished with a triple and four RBIs. Rose was selected to the Junior Sunbelt All-Tournament Team.